This third volume of Information and Behavior shows broad continuities with previous volumes in this series, but it also represents an important evolution. 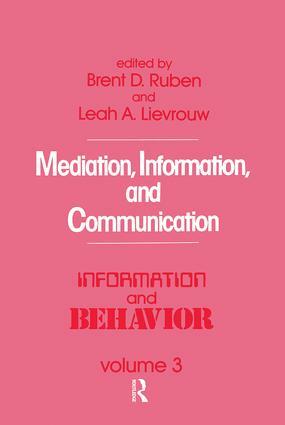 In emphasizing theoretical advances in mediation, information, and communication processes, this volume has unifying themes at the cutting edge of communication research, linking communication with areas as far-ranging as cognitive psychology, intellectual history, social psychology, policy, and macroeconomics. A sampling of the contents indicates both continuities and discontinuities of communication research embodied in this volume. Contributions include Joseph Turow, "Mass Communication as Concept"; Gary Grumpert and Robert Cathcart, "A Theory of Mediation;" Leah Lievrouw and T. Andrew Finn, "Common Dimensions of Communication"; Joshua Meyrowitz, "Mediated and Unmediated Behavior"; Kathleen Reardon, "Teaching Children About AIDS"; Sari Thomas, "The Death of Intellectual History and the Birth of the Transient Past"; Sheizaf Rafaeli, "Interacting with Media." The second part of the work, emphasizing research and policy in specific information societies and regions, includes an opening essay by Everett M. Rogers, and follow-up studies by Judith K. Larsen on "Silicon Valley"; Quentin W. Lindsey on "The North Carolina Research Triangle"; Luis Fonseca, "High Technology in Brazil"; Ruyzo Ogasawara, "High Technology in Japan"; and Mitchell Moss, "Telecommunications and Financial Centers." The final two portions of the book cover social theory and cultural processes. They include articles by Jerry Salvaggio and Richard Nelson, "Models for Developing Telecommunications and Information Industries"; Everett M. Rogers and James Dearing, "University-Industry Technology Transfer"; Frederick Williams, "The Communications Revolution Revisited"; Rolf Wigand, "Recurring Questions about the Information Society"; Lee Thayer, "Tropes and Things"; Gordon L. Miller, "The Energy of Intelligence"; David Carr, "Thinking in Museums;" Benjamin J. Bates, "Information as an Economic Good"; Jorge Schement and Daniel Stout, "A Time-Line of Information Technology."